There is no universally accepted agreement on what is or is not a token, nor even a tally. In this book the terms token and tally mainly cover those metal objects for which there is some historical or archaeological evidence that they served either as substitutes for denominations of legal money in short supply, or as a means of recording promised payments and services due, or as a method of keeping account of time, of possessions, of work output, or of the many other things humans felt a need to count and record. The accompanying texts and illustrations serve as an introduction to each category. The recommended bibliographies should put readers on the road to expertise in all of these fascinating series. The text ranges far and wide to tell the stories; the photographs show several hundred images of leaden tokens and tallies from every age. They cast much needed light on a group of collectable artefacts about which little has been written until now. This book is the third in Edward Fletcher's popular Tokens & Tallies series. 780 illustrations. 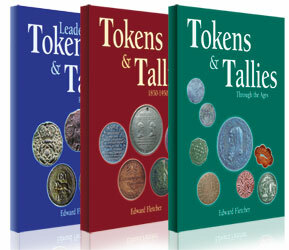 Choose any 2 of the Tokens & Tallies books for only £22 - saving £10!